Happy New Year and a big THANK YOU for an amazing 2018! 20 years ago, Nebraska looked much different. We’ve had tremendous shifts in our economic and community landscapes from Scottsbluff to Omaha, Norfolk to McCook. And while MY perspective of things may have been from about 2 feet closer to the ground and sitting in an elementary school classroom in Lincoln, I can appreciate the amazing changes that have come about. In fact, these changes have shaped my own upbringing – indeed I am, in many ways and like many others, the product of these significant shifts – including the one brought on by the Nebraska Cultural Endowment. In Memory of State Sen. LaVon Crosby of Lincoln, who, along with Sen. Don Pederson of North Platte, first championed this unique and powerful legislation. In the years leading up to the formation of the Nebraska Cultural Endowment, public funding for the arts and humanities at the federal level was under significant threat. Because of this mounting uncertainty, a visionary group of policy-makers and passionate citizens sought a solution to sustain our state’s treasured cultural resources, to be shielded from shifts in the political or economic landscape. 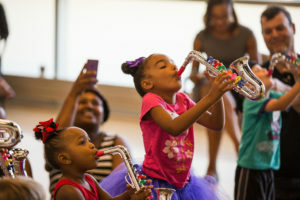 It was a solution other states have tried with varying degrees of success – to create a publicly-funded Cultural Trust. However, Nebraska being Nebraska, we wanted to do things just a bit differently… just a bit better. Instead of an entirely publicly-funded trust, we would create a public-private Endowment, where private investments in the arts and humanities of tomorrow would be matched, dollar-for-dollar, by a public investment in the same vision, and vice versa. Early aspirations for this initiative were to hold $25 million in order to sustain the arts and humanities by directing the earnings from investments to the Nebraska Arts Council and Humanities Nebraska. I am thrilled to share that the Nebraska Cultural Endowment… the product of the tireless work of these visionary policy-makers and community members… is currently responsible for investments of $21 million. What’s more, starting in 2019, we have the legislative mechanism to grow to a combined $30 million by 2028. However, we can’t do it without the support of our community. The impact of this nationally-unique, public-private partnership is exceptional and perpetual. Without decreasing the principal of $21 million, the NCE grants over $1 million per year back into the cultural sector of Nebraska, and we currently account for about 20% of each of the state councils’ budgets. As we grow to $30 million, we expect that to increase to 30% or greater, further sustaining the rich and vibrant cultural resources of Nebraska. Together, we will rise to this challenge – to ensure that future generations will have access to the same or better arts and humanities education, and that our grandchildren’s grandchildren will know a Nebraska that fosters creativity and free thought. With your support, Nebraska will remain informed, creative, and civically engaged. We all know Nebraska is a special place to live; and we have the opportunity today, to make sure that remains true tomorrow. So, in this time of celebration and renewal, I would like to thank our community for making Nebraska’s cultural landscape what it is today by embracing and supporting this powerful initiative; and I invite you to join us as we continue to cultivate a legacy for the arts and humanities in Nebraska. Humanities Nebraska announced that Pamela Hilton Snow of Ashland will receive the 2018 Sower Award in the Humanities. Mrs. Snow will be honored on Tuesday, October 9 at a benefit reception and dinner held at Lincoln’s Embassy Suites hotel. The 23rd Annual Governor’s Lecture in the Humanities featuring Pulitzer Prize-winning author Jon Meacham will follow at the Lied Center for Performing Arts. The Sower Award is presented annually to an individual who has made “a significant contribution to public understanding of the humanities in Nebraska.” This contribution can be through any combination of time, expertise, or resources, and the selection committee examines how the nominee has helped inspire and enrich personal and public life in our state through the humanities. 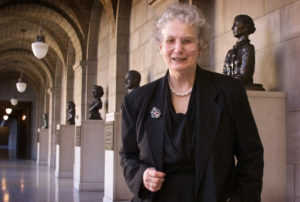 A founding board member (1999-2006) and former executive director (2006-2014) of the Nebraska Cultural Endowment, Mrs. Snow’s long history of serving the humanities includes being a board member (1996-2006) and chair (1999-2000) of Nebraska Humanities Council, and board member (1999-2006) of the Nebraska Foundation for the Humanities. She was also instrumental in bringing the Great Plains Chautauqua to Grand Island, planning and consulting for the Nebraska Book Festival, and recruiting Humanities Nebraska board members. Mrs. Snow has served on several other boards and is a current board member of the Cooper Foundation. She travelled to other state humanities councils as a National Endowment for the Humanities site visitor and consultant, and helped strengthen many other Nebraska institutions. Mrs. Snow is credited for her leadership, organization, philanthropy, knowledge and love for the arts and humanities. She is also a talented writer and photographer. Her hard work in Nebraska, specifically the Grand Island area, led to the creation and enhancement of many institutions of the humanities that have benefitted countless communities. The 7:30 p.m. lecture is free and open to the public. Table sponsorships and tickets for the pre-lecture benefit reception and dinner are now available for purchase. For more details visit www.HumanitiesNebraska.org. From the board and staff of the Nebraska Cultural Endowment, congratulations to Pamela Hilton Snow for being awarded the 2018 Sower Award in the Humanities. This award recognizes Mrs. Snow’s tremendous leadership, commitment and dedication to furthering the humanities in Nebraska. She has, and continues to, cultivate a legacy which has empowered communities and inspired many. Please consider joining the Nebraska Cultural Endowment and Humanities Nebraska, along with the Nebraska Arts Council, as we, too, cultivate a legacy for the arts and humanities in Nebraska. Happy New Year to the Nebraska Cultural Endowment’s partners, friends, constituents and beneficiaries! I am thrilled to be serving our cultural communities with you through the mission of the NCE and our partner organizations, Nebraska Arts Council and Humanities Nebraska. This year marks 20 years of the Nebraska Cultural Endowment creating sustainability funding for our state’s cultural resources. It is thanks to the vision and initiative of the Nebraska Legislature, and the community in response, that we have this truly unique asset in Nebraska. The Nebraska Cultural Endowment is honored to be participating in Omaha Gives 2017, Omaha’s 5th annual 24-hour charitable challenge which is set for this Wednesday, May 24. The giving begins at midnight with a minimum $10 donation and hourly drawings and prizes make your donations go further. When you give to the Nebraska Cultural Endowment, your gift is matched dollar-for-dollar by the state and will preserve the arts and humanities in Omaha and throughout the state of Nebraska both today and for future generations. State Sen. LaVon Crosby of Lincoln, OMAHA WORLD-HERALD STAFF PHOTO BY JEFFREY Z. CARNEY. FOR USE WITH LESLIE REED FEATURE.